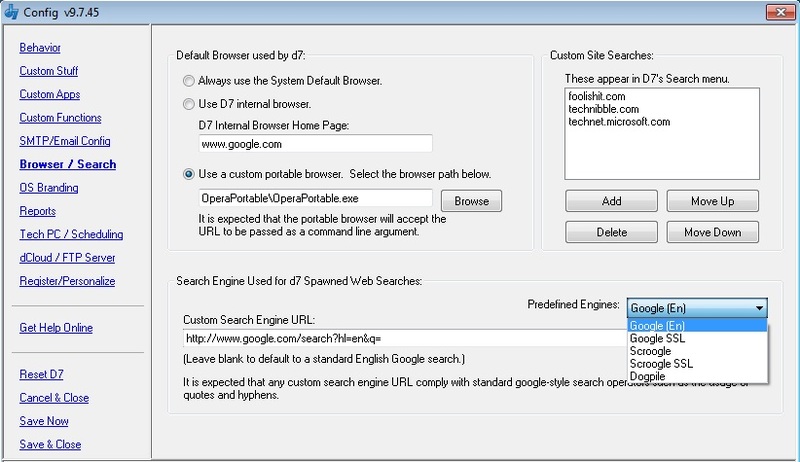 Use d7 internal browser – d7 has an internal web browser (which uses components of IE, but without all the bloat.) With this option unchecked, the system default browser is used. With this option checked, d7 will launch internet links inside the internal browser (example, for d7’s built-in Google functionality), except when the links relate to testing the system’s default web browser, in that case the system default browser is used. d7 Internal Browser Home Page – Naturally, this is the home page of d7’s internal browser! Custom Site Searches – These items appear in d7’s Search menu, and are designed to give one click access to display search results from only the selected domain when doing a web search. When you click one of these items from the Search menu, e.g. 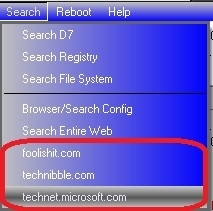 technet.microsoft.com and enter your search query, d7 automatically appends the site:technet.microsoft.com to your search query. Custom Search Engine URL – Anytime you search the web in d7, either via the main Info tab, or via the “Google” buttons in various locations, and with Google functionality in Shell Extensions/Context Menu Items, you need a search engine! Previously this was always Google’s basic search. Now you have the option to enter in your own custom search engines! Leave this option blank to use the standard default Google search. It is expected that a custom search engine should be compatible with search operators used by Google, specifically quotation marks and the minus sign. Predefined Engines – Here I have setup a few predefined search engines for you to choose from. You may also select a predefined search engine to place it’s string in the custom search engine category, and modify the string to behave the way you want it to. For example you could choose the standard Google search, and replace english with your language of preference by modifying the hl=en parameter!